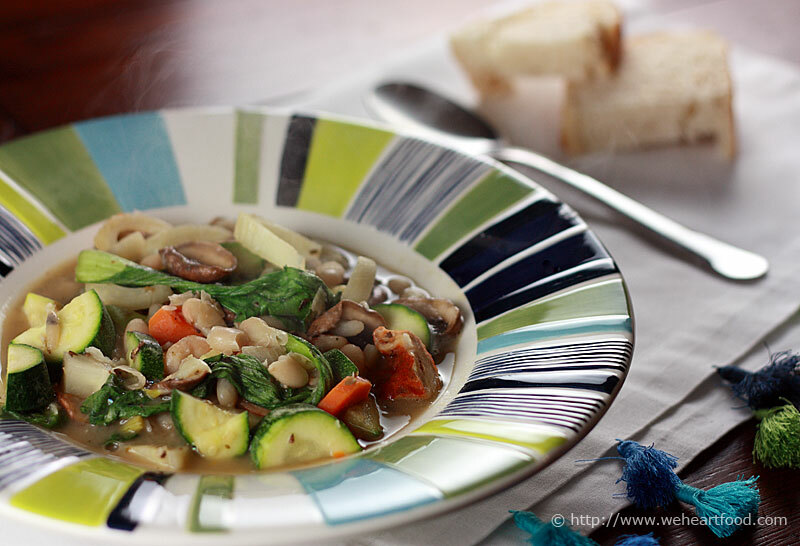 Here’s a dish we made a few weeks ago from The Ultimate Soup Bible . A salmon fillet is cut on the diagonal into thin slices which are seared and then placed into a bowl of steaming hot, richly-flavored broth and udon noodles. Baby bok choy adds color and some crunch. Oh my god, it’s a miracle. Okay, two miracles. One, you’re updating the blog. Two, the recipe doesn’t include mushrooms. Since when are mushrooms a problem? They’re not… it’s just… I’ve gotten comments. I’ve heard things. Yeah. People are starting to think that’s all we eat. Well we do like mushrooms. You want to talk about this dish at all? Oh yeah, right! I loved it! Those really thin slices of salmon were awesome. And I just love a big bowl of soup. Same here — I hadn’t grilled such thin slices like that before. It worked out well. And those thick udon noodles are great for slurping. You know how much I love the slurping. Yes. Yes I do. And I guess if the biggest complaint about a dish is how loud it is when your dining partner eats it… well that’s really not much to complain about at all. Pour the stock into a pot and add the ginger, garlic, and a third of the green onions. Add the soy sauce and sake, and bring to a boil. Lower the heat and simmer for 30 minutes. Meanwhile, cut the salmon at a severe angle into 12 slices. Brush a grill pan with the oil and heat until very hot. Sear the salmon slices for 1-2 minutes on each side until tender. Set aside. Cook the udon noodles as per the directions, then drain and cool under cold running water. Drain again. Strain the broth into a clean pot, season, and bring to a low boil. Add the bok choy. 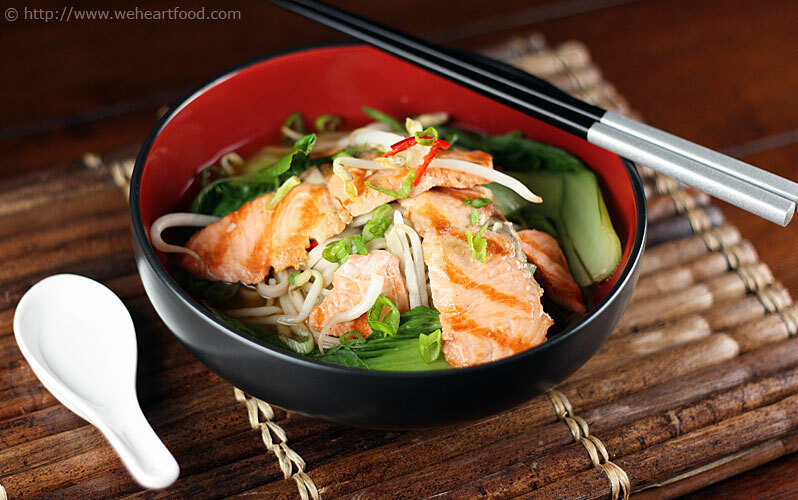 Divide the noodles among 4 deep bowls, along with the salmon slices, green onions, chili, and bean sprouts. Ladle in the broth. I was looking for a dish that would go well with our Korean pancakes, and after a quick interwebs search I came across this dish at epicurious. 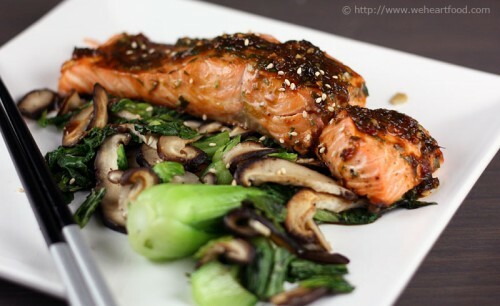 Rather than the usual sirloin, this recipe uses salmon as the lucky recipient of a tasty, spicy marinade made with soy sauce, onions, ginger, sesame oil, and more. It’s served over a bed of baby bok choy and shiitake mushrooms. I only made slight modifications to the recipe — I doubled the marinade and upped the number of mushrooms. The sauce/glaze is deeelicious. Yum, this is really good! Yeah, I really like how the salmon is cooked.. super tender on the inside. And I think that’s the first time our oven’s been set at 500. Well mark it in the calendar. … anyway … I loves me that marinade/glaze. It’s good on the veggies and the salmon. You know, that spicy red sauce from the pancakes is good on my salmon, too. I’m sure that’s good on cardboard. I think we’re going to have to do more Korean recipes soon. Blend 1 garlic clove and next 7 ingredients in mini processor. Arrange salmon in a small glass baking dish. Spoon marinade over, and let marinate 5 minutes. Preheat oven to 500°F. Transfer the fish, with some marinade still clinging, to a rimmed baking sheet. Roast the fish until just opaque in center, about 8 minutes. Meanwhile, transfer any remaining marinade to a small saucepan. Bring marinade in saucepan to boil; set aside and reserve for glaze. Heat oil in large nonstick skillet over high heat. Add bok choy and mushrooms; using garlic press, press in 1 garlic clove. Stir-fry until mushrooms are tender and bok choy is wilted, about 4 minutes. Season with salt and pepper. Divide vegetables among two plates, top with the salmon, and brush with the glaze. Lisa wanted to cook something tonight, and keeping in mind that we had some great veggies to use from the CSA box, found this hearty stew on Fatfree Vegan Kitchen. Lisa made some modifications that changed it to be neither fat-free nor vegan, but it still remained healthy and was simple and delicious. We love warm stews on chilly nights, and Seattle has had quite a few of those lately! The kitchen smells really good. Well try this — it tastes really good. Oooh, yum — I really like this one! We’ve had a few stews that were similar, but this may be of my favorites. The fennel is good; it’s not overpowering. Look at all those veggies! It’s pretty filling, too. Prepare the fennel by removing the stalks and leaves (save them for another use). Slice about 1/4 inch off the bottom of the bulb, and cut the bulb in half, down through the middle (top to bottom). Cut each half into thin wedges, top to bottom. Add a teaspoon of olive oil to a large pot. Heat it on medium, and add the fennel and carrots. Sauté for about 3 minutes and then add the garlic and sauté for another 2 minutes. Add the beans, 1 cup of chicken broth, and all seasonings. Turn the heat to low and simmer for 15 minutes. Add the other cup of chicken broth, the zucchini, the mushrooms, and bok choy. Cover and simmer another 10 minutes, or until the zucchini is tender. Two new dishes for us tonight: baked cauliflower with a delicious tahini sauce, and ground turkey meatballs with a pomegranate syrup. We had originally planned to make this cauliflower dish (from Lebanese Cuisine) as part of the Lebanese feast last weekend, but there was already way too much food, and so we made an excuse to try again this week. The kebabs are listed as a variation on a turkey burger recipe in the How to Eat Supper cookbook; it isn’t exactly “authentic”, but the kefta was delicious all the same. To round things out, Lisa made baby bok choy sauteed with plenty of onions and garlic. This turkey kefta is way different than the versions I had growing up… but you’re right, it’s really good. Yeah — no pine nuts or bulgur in this one… Yum, I really like the way the cauliflower is cooked — I don’t think I’ve ever had it any other way than raw or steamed. I strayed from the recipe and used Jenn’s baking method instead of the one in the book. …that taratur sauce on it rules. Oooh — the sauce is actually also good on the kefta. I like how there’s not really a ton of tahini in it, but the sesame flavor really comes out. I like how there’s not really a ton of kefta left, because most of it is already in my belly. The flavor really went in. Heat a tablespoon of the oil in a nonstick skillet, and cook the onions and tomatoes, sprinkled with salt and pepper, over high heat until the onions start to wilt and brown, about 3 minutes. Add the garlic and cook for an additional minute. In a large bowl, add the ground turkey, onion-tomato mix, salt, pepper, coriander, cumin, cilantro, and wine. Mix together well and form into small balls. The mix will feel *really* delicate and sticky. In the skillet, heat the remaining tablespoon of oil over medium-high heat. Add the meatballs, and rotate every 30 seconds or so until all sides are seared. Cook for about 5 minutes, or until the meatballs reach an internal temperature of 150. Serve on a plate and drizzle the pomegranate molasses over the top. Heat the oven to 450F. Break the cauliflower into florets and place into a small bowl. Drizzle a little olive oil over the cauliflower and add a pinch of red pepper. 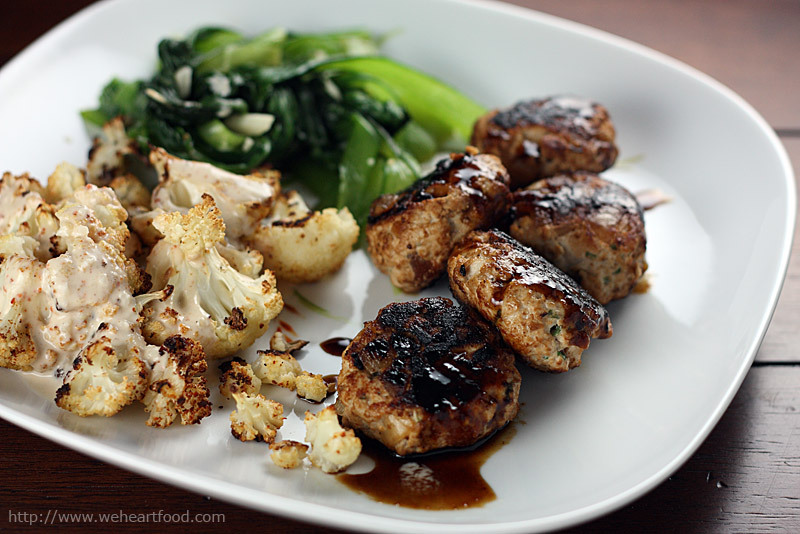 Toss until all the cauliflower is coated, then place in a single layer on a baking sheet. Bake for 25 minutes or until browned and tender. In a bowl, mix the crushed garlic and the salt. Add the tahini and blend well, then add the water and mix thoroughly. Add the lemon juice and blend until the sauce is whitish and smooth. Add red pepper to taste. Pour the sauce over the cauliflower and serve. 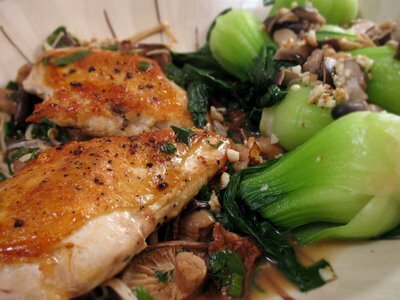 Chicken and Baby Bok Choy Shroom-stravaganza! Tonight I made two new recipes, each the first recipe we’ve tried in two new books — from The Mushroom Lover’s Mushroom Cookbook, Boneless Chicken Breasts with Wild Mushrooms and Enoki, and from Asian Flavors, Baby Bok Choy with Garlic and Straw Mushrooms. Wow — you can really taste the wine in this. Yeah, I kinda wish we had the cognac that the recipe calls for on hand. Really? I love the wine — and the really interesting variety of mushrooms! Yeah, it’s delicious. I just ended up getting a bunch of different mushroom varieties because I couldn’t find Mousserons. What about the bok choy? Mmmmmm, so good! You know I’m going to say that it needs more garlic — but what doesn’t? Sprinkle both sides of the chicken breasts with salt and pepper. Heat the oil in a large, heavy skillet, preferably nonstick. Add the chicken breasts, skin side down, and cook until the skin is deep golden brown and crisp, about 6 minutes. Turn the chicken breasts over, reduce the heat to medium low, and continue cooking until no trace of pink remains in the thickest part of the chicken, about 6 minutes. Remove the chicken breasts, add the scallion whites and mousserons or wild mushrooms. Cook until the mushrooms are wilted, about 3 minutes. Add the Cognac or wine and cook until evaporated. Add the stock and boil until the sauce is reduced to about 1/4 cup, about 4 minutes. Add the enoki, parsley, and scallion greens and stir to mix. Return the chicken to the skillet, skin side up. Reduce the heat and simmer 2 minutes. Serve hot, spooning half of the mushroom mixture and sauce onto each of 2 plates and topping it with a chicken breast. * If using dried mushrooms, reconstitute by pouring hot chicken stock over the mushrooms in a bowl and letting sit for 10-15 minutes. Drain the mushrooms, then strain the soaking liquid through a coffee filter and save for use in the recipe. Blanch the bok choy in a saucepan of boiling water for one minute. Drain, and cool by running under cold water. Heat the oil in a wok, add the garlic and fry gently for one minute until golden. Drain from the wok and set aside. Add the straw mushrooms and bok choy and stir-fry over high heat for two minutes. Add the rice wine, sugar, and salt, and stir until the vegetables are coated in the wok juices. Transfer to a serving plate, spoon over the garlic, and serve at once.